The chances are good that your business can benefit from video conferencing - regardless of how big you are or what industry you are in. Unfortunately, there are several prevalent myths that prevent many business owners from investing in good video conferencing tools. These range from the overall cost and applicability of the tools to the ROI you can expect after implementing one. Don’t make a decision based on bad information. 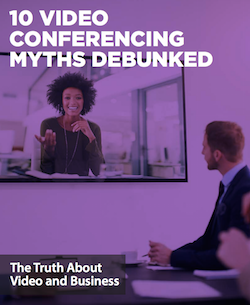 To make sure you haven’t fallen for one of these myths, read this report on 10 Video Conferencing Myths Debunked.